This symposium is a sponsored session by ILSI SEA Region at the 5th International Rice Congress 2018. Feeding a growing population while ensuring the food is nutritious has emerged as a major challenge faced by governments and health authorities of many developing countries. It is recognized that agri-food production and supply systems need to be more productive and efficient, as well as sustainable with least environmental impact for the future. Establishing key metrics and appropriate indicators to assess status such as resilience of the food system, nutrition adequacy, dietary quality, and diversity, will help to identify and fill gaps and measure progress towards attaining nutrition security. 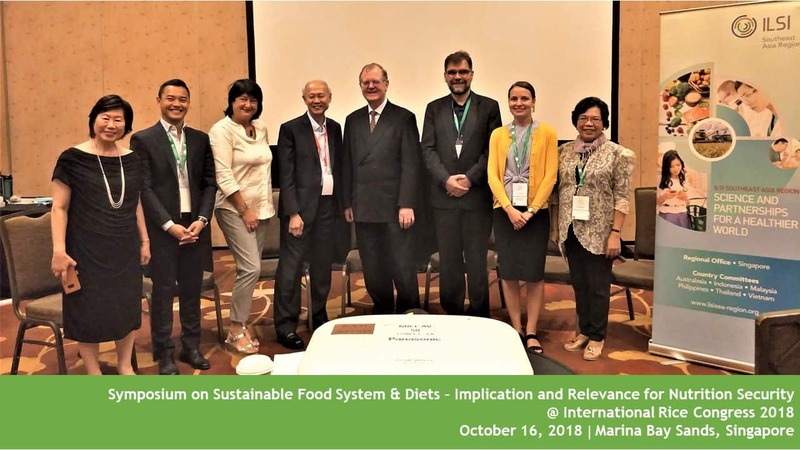 This symposium will highlight challenges in sustainable food systems and nutrition security in Asia, discuss utilization of metrics for intervention, as well as the harnessing of innovation and new technologies. A panel will discuss and elucidate strategies to transform nutrition security challenges into opportunities for the future. Dr. Felipe Dizon, Economist of World Bank, U. S.
The executive summary of this symposium is available HERE.